On Wednesday, December 12, 2018, PAL held the Girls’ School Basketball Championships, hosted at Loyola High School in Detroit, Michigan. Both the junior varsity and varsity championships were held! The Junior Varsity Championship was a game of determination by both David Ellis Academy-West and Chandler Park Academy. Chandler Park Academy opened scoring with a two-pointer, showing their ability to work as a team early to score. However, DEAW showed a strong defensive game, keeping CPA scoring at bay. The first half ended in a score of 3-6 with CPA in the lead. The second half displayed both team’s ability to keep the ball moving up and down the court and work as a team. Chandler Park Academy showed a strong offensive game that resulted in quick baskets and forcing turnovers to keep the ball at their scoring end of the court. While DEAW displayed smart defensive skills, keeping their hands high to block shots and moving quickly, CPA were still able to successfully score. 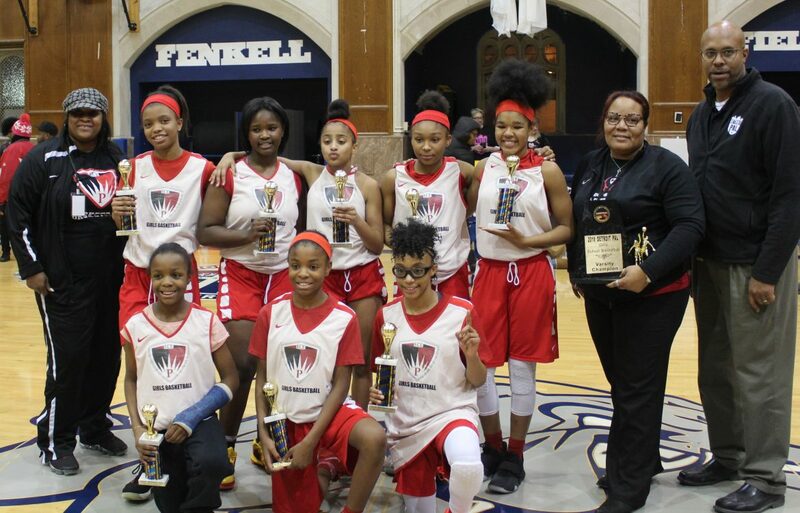 Chandler Park Academy’s ability to keep the ball moving towards the net resulted in their success, being named the Girls School Basketball Junior Varsity Champions! David Ellis Academy-West was gracious and displayed the utmost sportsmanship, taking the time to congratulate the Chandler Park Academy team and coaches. After the runner up and championship awards were given out, coach and team awards were handed out to their respective teams and coaches. The first award, Sportsmanship Team of the Year was awarded to David Ellis Academy West and Coach Brian Autrey! David Ellis Academy West had an outstanding season on the court in both junior varsity and varsity. This team made sure all of their players saw playing time and shook hands after each and every game. Congratulations to DEAW and Coach Brian! Organization of the Year was awarded to Chandler Park Academy, and was accepted by Coach Brenda Pendleton! Chandler Park Academy was awarded Organization of the Year for their work doing amazing things in their community including “Lil’ Eagles Mentoring” where they volunteered with the Stoney Creek Marathon passing out water to runners. They also visited the Regency Heights Nursing Home and Rehabilitation Center to spend time with elderly residents. Congratulations to CPA and Coach Brenda! The final organizational award was Coach of the Year. Coach Antwone Jefferson of Lincoln-King Academy was rewarded for working relentlessly with his players day in and day out, making them better athletes and all-around young ladies. Congratulations to Coach Antwone for all of your hard work and success this season! Finally, the conclusion of the night was Girls School Basketball Varsity Championship game! Lincoln-King Academy (LKA) took on Detroit Edison Public School Academy (DEPSA). The game brought out a packed crowd that was loud, excited, and ready to see some action! Lincoln-King Academy won the opening tip-off and opened scoring with a two-pointer! The first half of the game showed a lot hustle up and down the court, with little scoring until late in the first. DEPSA made a strong push late in the first, scoring several baskets quickly giving them the lead at the end of the first. The score at the end of the first was 16-5 with DEPSA in the lead. The start of the second half, DEPSA continues with a strong offense, driving LKA to play a strong defensive game. Lincoln-King kept a calm and collected demeanor, and started to take charge on the court, brining scoring much closer with only a four point deficit late in the second half with only a few minutes left in the game, bringing the score 20-16. However, even after LKA’s late push in the second half, DEPSA regained their offensive dominance on the court and closed out the game 32-22, being named the Girls School Basketball Varsity Champions! Both teams played a heart-felt, determined game that showcased strong suits on both ends of the court for each team. Both teams played as a cohesive unit, and displayed their abilities to take instruction from their coach to enhance their game that much more. To Chandler Park Academy, David Ellis Academy-West, Lincoln-King Academy, and Detroit Edison Public School Academy, accept our congratulations from Detroit PAL on an amazing season of player and character development, sportsmanship, and showcasing the best of your abilities. To the coaches and support around these amazing athletes, thank you for your time and dedication to challenging these ladies to excel in the classroom, on the court, and in the community! Congratulations again to all four teams!